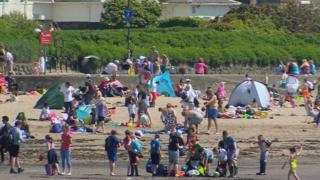 Doctors are warning people to take extra care in the sun as parts of Scotland prepare for one of the hottest May Bank Holiday weekends. BBC forecasters say temperatures in the west are expected to rise as high as 24C (75F) on Monday. NHS Greater Glasgow and Clyde said particular care should be taken of the very young, the very old and those with chronic diseases. It also said hot weather could affect people with respiratory problems. Temperatures in the north west, west Highlands, and south west Scotland are likely to reach 22C (72F) and 23C (73F) over Saturday and Sunday. The warmest late May bank holiday weekend on record is officially 32.8C (91F), set on the 29 May 1944 bank holiday Monday in Horsham, West Sussex, and Tunbridge Wells, in Kent, together with London's Regent's Park just a few days ahead of D-Day. Dr Linda de Caestecker, NHS Greater Glasgow and Clyde's director of public health, said: "We want everyone to enjoy their time in the sun but people need to be sensible and take precautions, which will ensure they stay healthy while enjoying the weather. "The aim for everyone is to have an enjoyable weekend, in this much anticipated warm spell, while avoiding food poisoning and sunburn, neither of which are very much fun." Fire chiefs in Scotland have warned of an increased risk of wildfires, following a series of blazes across the country. They have reminded the public that discarded cigarettes and unattended barbeques or campfires can start fires which burn for days and devastate vast areas of land. The Scottish Wildfire Forum has urged people to follow the Scottish Outdoor Access Code. Meanwhile, BBC Music's May Bank Holiday music festival - The Biggest Weekend - is taking place at four UK locations this weekend with Scone Palace in Perth staging the Scottish event. With more than 175,000 tickets available to the public, the one-off festival promises to bring the nation together for a massive celebration of live music. Nigel Kennedy headlined at Scone Palace on Friday with Evelyn Glennie, Jamie Cullum, Eddi Reader and the BBC Scottish Symphony Orchestra also performing. Noel Gallagher's High Flying Birds will be topping the bill on Saturday with Simple Minds and Emeli Sande also in the line-up. The other sites are in Belfast, Coventry and Swansea.